>Of all the harbors that I have visited in Maine, one of my favorite is Damarascove Island. Just 5 miles south from Booth Bay Harbor. 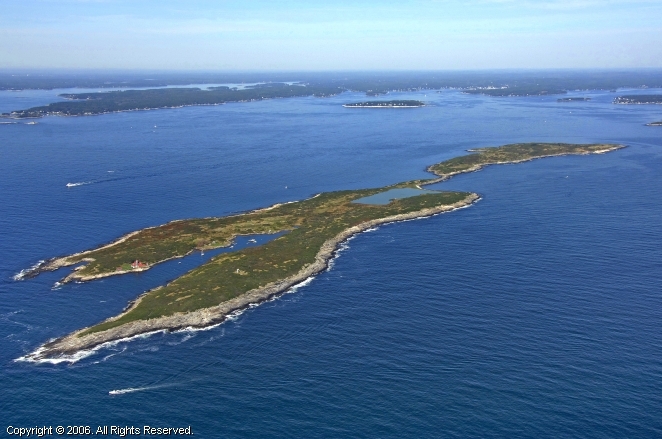 The island is largely uninhabited and owned by the Boothbay Region Land Trust. 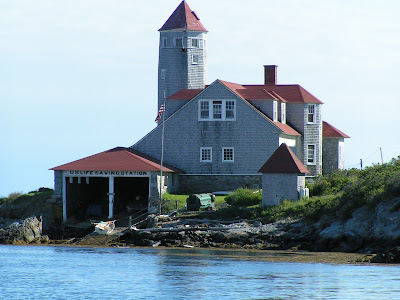 The only private residence on the island is the old coastguard life station located just inside of the mouth of the harbor. There’s also a small cottage manned by a caretaker in the inner harbor that keeps watch on the island and visitors. 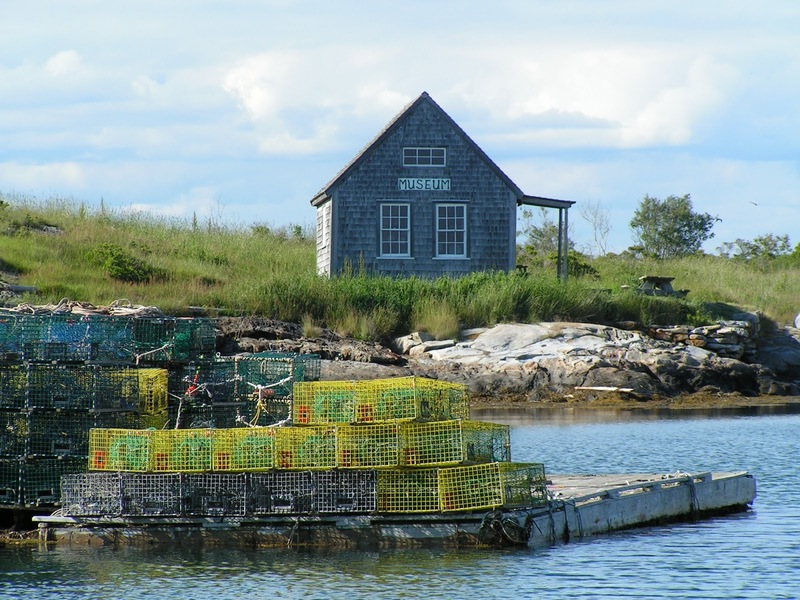 There’s also several floats moored in the inner harbor where local fishermen keep their extra lobster traps. The coastguard station, located on the western point of the harbor mouth is really a wonderful structure and has been restored by it’s private owners. The harbor is extremely narrow and opens to the south. This would suggest that the harbor would be rough but that’s not the case as the very narrow entrance, which looks more narrow when you approach compared to this photo, is protected by rock ledges on both sides. This shot of the island from the air shows the harbor on the lower left with the Coast Guard station to port as you enter from the south. As the harbor narrows toward the center of the island, there are a few moorings that you can pick up. It’s really narrow and Pandora at 46′ overall nearly touches the shore when she swings. For this reason, I pick up a second mooring to keep her in the center of the channel. The moorings are located at the very narrowest part just before it opens up toward the most inner portion of the harbor. This shot is of my last boat Elektra was taken a few years ago on a mooring in the inner harbor. You can really see just how small the harbor is. 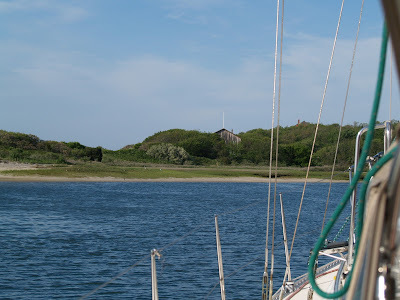 To the right of the photo is a public landing that’s used by visitors as a place to put your dinghy while going ashore. There’s also a wonderful little one room museum overlooking the harbor that has interesting artifacts from the island’s history. There are well groomed trails that run all the way from the harbor to the most northern point of the island but some areas are closed off during nesting season so as to provide for more privacy for visiting common Eider ducks. This is yet another shot of Elektra that I took a while back in the inner harbor and it gives you a great feel for just how isolated the harbor and island really are. The light this day was particularly dramatic due to a passing thunder storm. 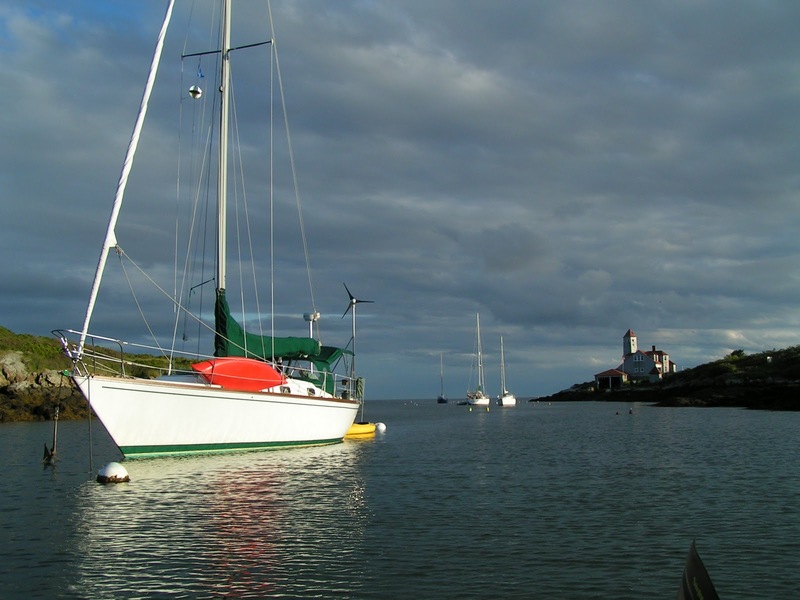 Notice that there are only a few other boats anchored in the outer harbor, still protected from the waves in normal settled summer weather. If you go there on a weekend expect to see a good number of day trippers. However, on the weekends you can have the place to yourself. 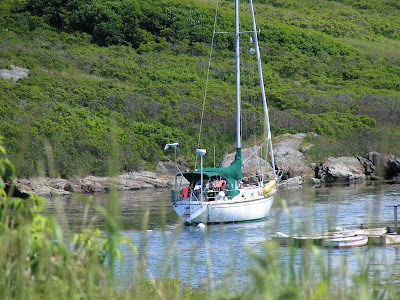 Besides, if you arrive and it’s too crowded, it’s only a short distance to Booth Bay Harbor. 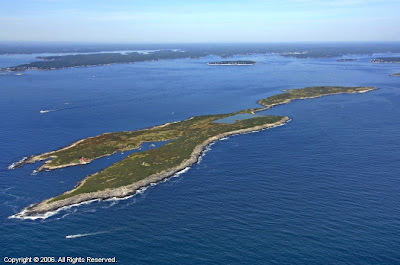 While Damarascove Island looks a bit intimidating on the chart, if you are looking for a bit of a challenge and are comfortable maneuvering your boat in tight quarters, I encourage you to visit this little gem, located just 5 miles off of the coast from Booth Bay Harbor Maine. 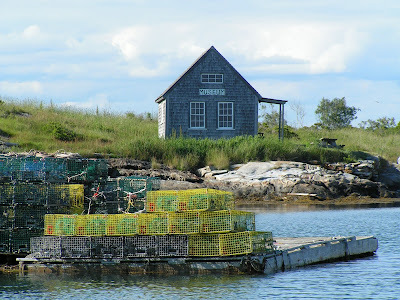 For more information about this and other great places to visit in Maine, the best book around for such information is the Taft Cruising Guide to the Maine Coast, available at many locations including Landfall Navigation. >With some of my friends headed south for the winter and the prospect of the coming months off of Pandora, I have been struggling with what to write about here. I could certainly report on every move I make on planned upgrades to Pandora but that doesn’t make for very compelling reading. The question of what to write about each week (yes, I know that I should post more often than that) is one that has been bugging me ever since I put Pandora up for the winter. Actually, yesterday I did put the finishing touches on her with the cover in place and all systems winterized, which will allow me to focus on home and getting the yard cleaned up, etc, etc. So the question now is what to write about. Between scintillating posts about new freezer systems and other projects on Pandora what will be compelling to others. Perhaps nothing but I have to do something. Here’s an idea. How about writing about some of my favorite harbors and what you might do while you are there if an when you visit? Yea, that’s the ticket!. Ticket or not, that’s what I am going to write about and today will be the first post with that in mind. As we go along over the next few months, I encourage you to provide your own suggestions and comments on places to visit or on what you think of the places that I highlight. Perhaps a good place to start is to focus on where Pandora will be after she goes in the water in early May. As she is now in Norwalk CT, when she goes back in the water I will run her immediately back up to Mystic where she will spend a few weeks on my friend Kieth’s mooring. There are a number of really fun harbors within a reasonable distance of Mystic. One in particular worth noting, on the North Fork of Long Island and about 30 miles from Mystic, is Mattituck. This harbor is the only one between Port Jefferson and Greenport on the north shore of Long Island. On the chart the entrance and narrow channel looks daunting. In fact, as you approach it from the north, it’s very hard to see and without a GPS coordinate to direct you, to the entrance, it’s very hard to even see the low gettys that mark the entrance. This shot is taken near the mouth of the channel as you come in. It’s very rural here. Pandora draws just under 6′ and I have never had any trouble getting in, even at low water. 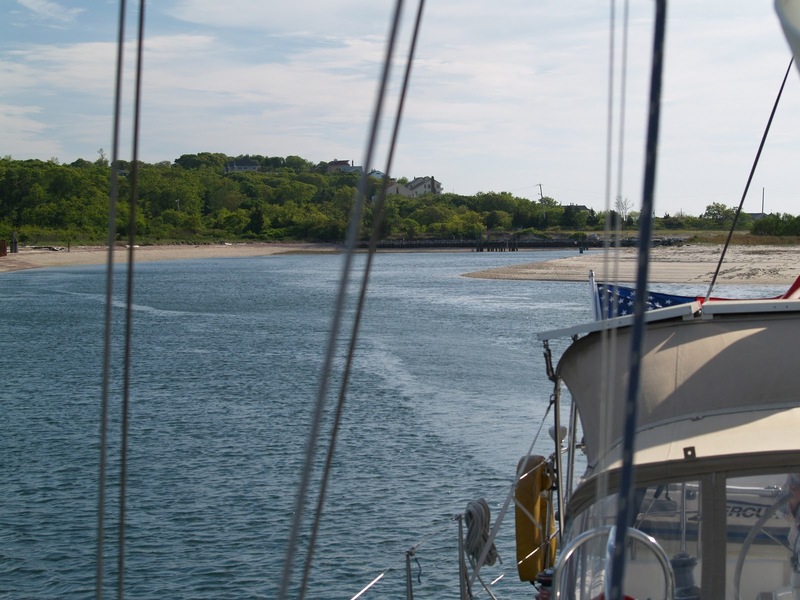 Once you enter the nearly two mile long channel, you feel like you have entered a time warp as the area is much more unspoiled than most harbors on Long Island. 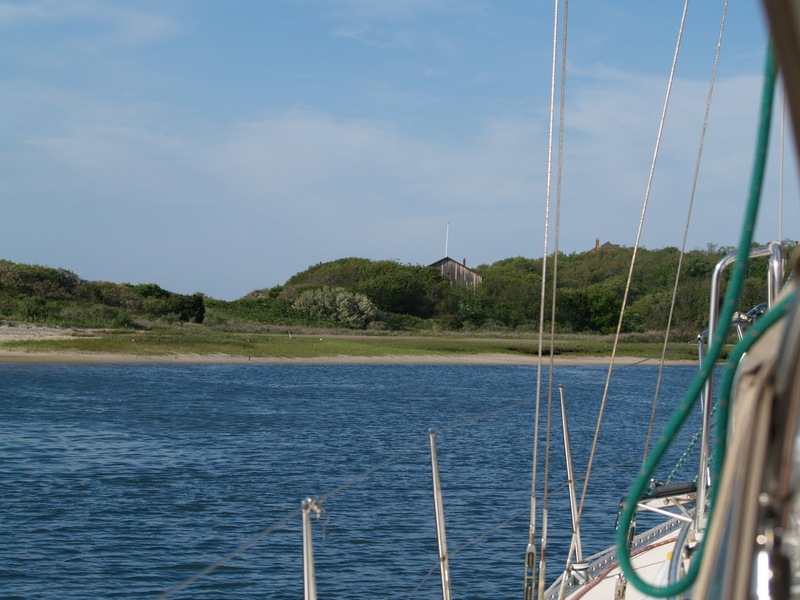 The banks of the channel are largely undeveloped with only a few homes and marinas scattered along the banks that run several miles to the anchorage. 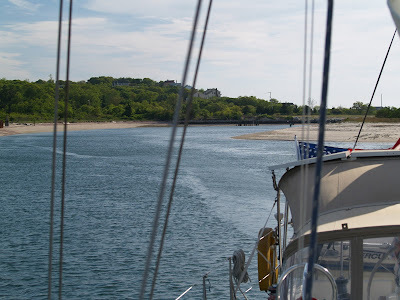 At the end of the channel there is an area to anchor (it looks a lot smaller on the chart than it is) with good holding an mercifully free of moorings, something that can’t be said for many other areas on Long Island Sound these days. There is a public landing nearby where you can leave your dink and make the short walk into town. One particular treat is that the landing boasts a small park, bathroom and even free showers. In all of my years of cruising I haven’t run into free showers elsewhere. Brenda and I began visiting Mattituck back in the early 80s and hadn’t been back for many years. It wasn’t until we purchased Pandora that we began visiting again. Our most recent visit was on Memorial Day weekend in 2009 and we treated ourselves to a visit to a local winery. 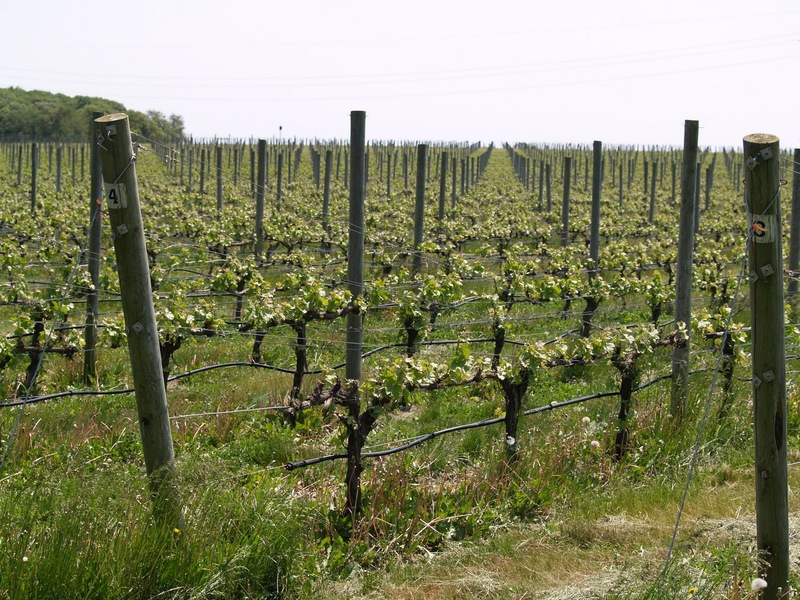 The North Fork of Long Island is loaded with vineyards and a few are within walking distance of the harbor. 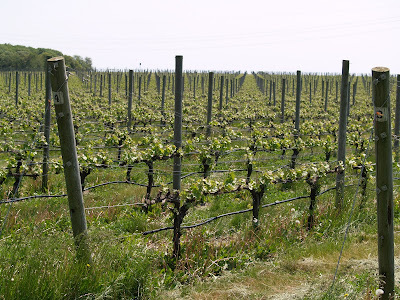 On this visit we went to Shinn Vineyards, one of two vineyards located within the town of Mattituck. Shinn is a wonderful place run by an enthusiastic couple Barbara Shinn and David Page. 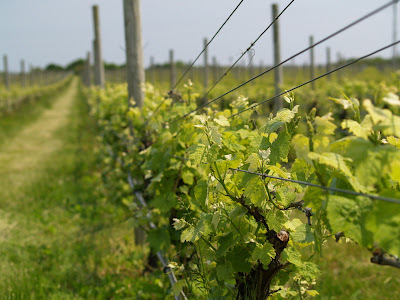 Interestingly, Shinn is the only vineyard on Long Island that is biodynamic. This means that they are even beyond organic but I will leave the explanation up to Wickipedia that features a good explanation of what it’s all about. Needless to say, the prorpiators of Shinn are enthusiastic about this form of viniculture. David also produces a really interesting weekly e-newsletter that you can sign up for. I signed up when we visited and you can to at this link or at the “contact us” area on their home page. However, David keeps a blog so you can read about what’s happening on the farm. Also, as a nice added feature, their wines are really good. Shinn Vineyard is located in a really beautiful area of the North Fork of Long Island. These shots don’t do the place justice. And, across the street, the view is just as wonderful. 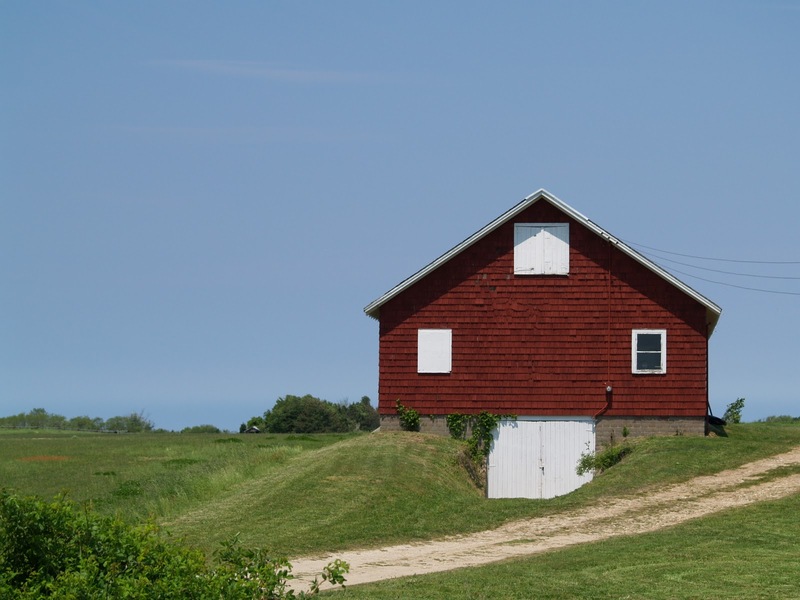 This is certainly a classic red barn shot. Imagine waking up each morning to this view. This is an interesting video that will give you a good feel for what Shinn is all about. Barbara speaks at meetings around the country about her passion, biodynamic viniculture. For more Shinn videos and lots of reviews of their wines check this out. If you want to avoid a nearly two mile walk from the harbor to Shinn, you can also rent a car from Enterprise Car rental in Riverhead. Enterprise will generally pick you up and drop you off when you return the car. Just make sure that you plan your rental time around normal business hours. When we were there Enterprise was not open on Sunday. They can be reached at (631) 369-6300.
on our cruise itinerary early in the coming season. >My good friend Roger headed out today from Hampton VA aboard his SAGA 43, Ilene. Roger, along with some 75 boats and upwards of 350 sailors (on different boats of course), as there are five aboard Ilene, is participating in this year’s Caribbean 1500 cruising rally from Hampton VA to Tortola in the BVI. After what will likely be a 10 day trip, Roger’s wife Ilene will join him in Tortola to begin a 5 month sailing trip through the warm tropical islands between the BVI and Trinidad, just off the coast of Venezuela. For those of you that want to watch the boats as they make their way South, you can follow them on this link as each boat (this link is to class 6) has a GPS transponder that “pings” a satellite about every 15 minutes to give a location speed and direction on this nifty chart. To learn more about the rally, which they have been running for about 20 years, check this out. I am so jealous of Roger and Ilene as they will be spending the winter in a great place aboard their boat and will have an opportunity to see places that most visit for a week or two. To be able to spend 5 months. DID I SAY 5 MONTHS SAILING IN PARADISE!, is just too much. While most of us are putting antifreeze into our water tanks, they are headed to warmer climes. After a week long delay due to a late season hurricane, it seems that the forecast was a go and they are on their way. The forecast for the next few days is to provide strong NW winds which will speed them on their way south. God’s speed to Ilene and the rest of the 2010 Caribbean 1500 participants. You can follow Roger and Ilene’s travels aboard Ilene the Boat at www.ilenetheboat.blogspot.com. I guess it’s time to go to work. Drat, no make that double drat.